It’s Friday and that means it’s time for a GIVEAWAY! I hope by now you are wondering how you go about entering to win the Field of Daisies Summer Card Kit. it’s easy. All you need to do is leave a comment on this post before midnight on July 27th. A random winner will be chosen to win! Go ahead, leave a comment, you know you want to win! Don’t forget to follow SCTMagazine on Instagram to keep up to date with the team. What a fun kit! Would be awesome to win it!! Thanks for the giveaway! What a sweet & cute kit! I see so many awesome summertime creations ahead for a lucky winner!! Beautiful kit! Lovely colors for summer. Looks like such fun to work with! What a beautiful kit! I just love sending homemade cards to friends and family. I have never thought about buying a kit just for card making but it sounds like fun! I would love to win this kit and give it a try! Thanks so much for the chance to win this! Very cute kit! So hard to find Shimelle papers. Would love to win this card kit. Thanks! Wonder and fun looking kit! So much creative elements. Love daisies. So this is a great prize. Love so summery! i am totally in the mood for those colors. Love the colors in this kit and the daisies are a wonderful way to send love and greetings! I AM LEAVING A COMMENT, BECAUSE I WOULD LOVE TO WIN THIS CARD KIT! THANKS FOR THE CHANCE! I definitely love the papers in this kit! Looks like another winner! That is a gorgeous kit! Thanks for the chance to win!! Such summery fun! I really feel the need for some new card inspiration, and this kit is perfect! What a breath of summer! Colours are great. love the bright and colorful, and daisies were always my mom’s favorite. What a fun kit! So summery. I love the colors in this kit! Thanks for the giveaway- I think I could make lots of fun cards with it. Yes please! It’s so pretty. Such lovely colours – good luck to everyone. Looks like a gorgeous kit! Lots of creative possibilities! very cute, looks so fun to work with! I already have this kit and made a few cards, so l would give this one to a good friend if l won. Thanks for the chance to win? Perfect name for this delightful summer kit! Looks like a beautiful summery kit! Thanks for the chance to win! I love daisies. Will look gorgeous on the cards and layouts. Thanks for the great contest! Just love this kit! Daisies are my favorite flowers! This is a beautiful summery kit full of fresh looks and colours, a great addition to any craft room. Love it. Looks like a lovely kit. Wouldn’t mind winning it at all! Since I mostly make cards, I’m sure I would put it to good use. Thanks for the chance to win. Would love to win this kit!! 🙂 Thank you for the opportunity to win it! looks like a fun kit !! Wow – fantastic kit (but really…all your kits are). The layers, colours and embellishments speak “Summer”! Perfect to scrapbook my daughter. Her favorite flowers are daisies. We call her “DaisyJen”. Thanks for these lovely giveaways. Such bright cheery colours on this beautiful kit. Would be fabulous to create with! card – would be wonderful. Loving the pinks and yellows in this kit! Thanks for the chance to win. Gorgeous patterns and colors. SCT kits are the best! Looks like a fun kit. Thanks for the chance. 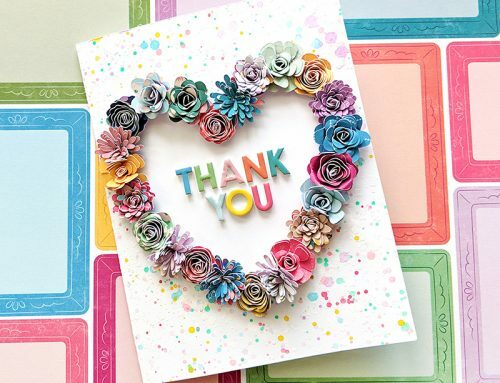 Beautiful kit for cards – would love to be a winner! Thanks for the chance. Thanks for the prize. I don’t have a digital cutter but it’s still a lot of stuff I would use. A beautiful kit with so many possibilities to be creative. Love it. This is a great kit with a lot of fun colors. Thanks for the opportunity to win. What a beautiful kit! Love the colours, especially of the enamel dots! Would love to win this kit! I would use it to spend quality time with my grandkids making cute cards. Thanks for the chance to win. What a great kit!! It would be amazing to win…thanks for a chance!! Wow! What a beautiful card set! I love everything about it! I was glued to that video the whole way through! Thank you for the chance! What a beautiful kit! Thanks for the opportunity to win it! So pretty! I could certainly make good use of this lovely kit! What cute papers. I love the bicycle embellishment. This kit would certainly cheer up a cold winters day. Thanks for the chance to win. I just love the SCT kits and try to buy them when I can! Cute kit & I could give it a good home. Whoever wins this is so lucky!! Looks like so much fun to create with. This collection is beautiful!!! Daisies are synonymous with summer and we want to be able to see them as long as possible! This set will make summery cards for now and when we need a little hope for Spring. Good luck all! So pretty! I love the bright and the colours in this kit. 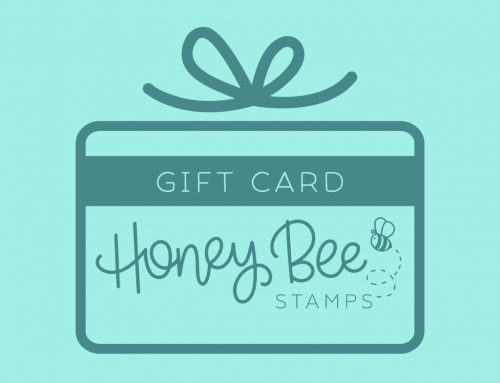 It would be fun to play with this fun giveaway! You have put together a GREAT kit! Thanks for the chance to win it. 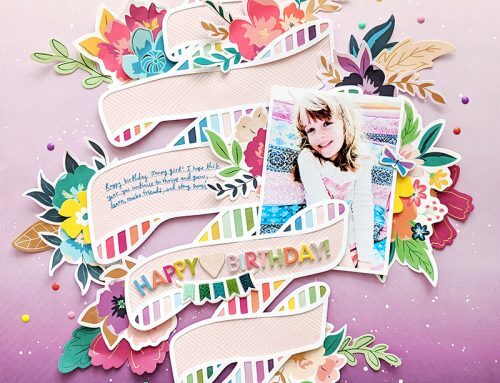 I just love all the bright colors and cute papers and embellishments in this kit. 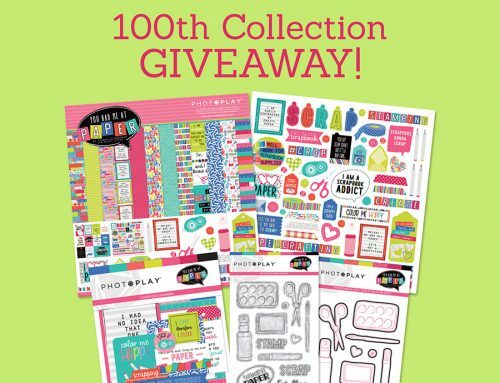 My two girls would love to help me make cards with these fun goodies! This kit is so cute, and I love the summer theme! This would even motivate me to do some scrapbooking and catch up with a few of my old photos! Looks like a really fun kit! Thank you for the chance to win!! What a pretty kit, thanks for the change to win. What a cheerful collection! Thanks for the opportunity to win! Such a pretty kit! Thank you for the chance to win. Pretty patterns! Thanks for the opportunity to win! Lovely kit. I love that it comes with everything you need to make some fab creations. ooi la la, drool and then some! What a great looking kit! Would love to win this, thanks for the chance. Colourful, fun and overall beautiful kit! Thank you for the opportunity to win. Have a great time with your son! Wow this kit is fabulous with lots of goodies, the best thing being the summer issue. It would be fun making pages or cads with this kit. Thanks for bringing to us. So cute!!! If I don’t win, I gotta have this kit!! What a beautiful, happy kit. I would love to make happy cards to send to friends using this kit. Thank you SCT! I am a big fan of your kits and this one is beautiful! I’ve recently gotten into cardmaking big time and love making someone’s day brighter when they receive a handmade card. So I’d definitely put the kit to good use! Such a great kit, looks so pretty with all those gorgeous colors!!! It’s a beautiful kit! I put mine together last weekend! Good luck to all who enter! I would love to win this kit. My kids and I would really enjoy this. Thanks for the chance to win. ??? Oh yes, I definitely would love to win this kit! Thank you so much for the chance!! This is a lovely fun kit. So many colours and patterns. Love it. Such a fun kit! Thanks for the chance to win. Love how you always put together such beautiful kits with all sorts of goodies! Wow! What a beautiful kit, I would love to win it! Who doesn’t love daisies, they are so delicate and beautiful….who wouldn’t love to win this gorgeous kit with all beautiful paper and everything you need to create masterpieces. Oh the cards and pages that are must in the waiting. Thanks for this awesome chance to win. I have enjoyed “creating” with kits I have ordered and the daisies look like a pretty colourful set! What a fun and colorful kit. This would be awesome to scrap my Niece and Great Niece and Nephews visit to Michigan. Thanks for sharing with us! I bougth the scrapbooking it, which is fabulous and i would love to win this card kit as I love to make cards too! Thanks for everything you do! Cute summer card kit. Great giveaway! Thanks for the chance to win. Really fun kit. I love the stamp set and die, so many possibilities. This kit looks gorgeous! Love the bright colors and happiness in this kit. Thanks for the chance!! What a great card kit! I love the colours and daisies. Thanks so much for the chance to win amazing giveaway! What a lovely and happy kit. Thanks for the chance to win. The kit looks fantastic and I’d love to win it. Thanks for the chance. Gorgeous looking kit – I love the colors. What a fun and colorful kit, would be fun to win this, like a little bit late birthday gift! Wow!!! Such a beautiful kit!!! Love it!!! Your card kits are always so amazing and packed full of fun goodies. Love the colours in this kit, they are fabulous. Thanks for the chance to win! That is a beautiful kit. Thank you for a chance to enter this giveaway. Wow – this screams summer! And since it is my granddaughter’s first summer, I have so many fun things planned. All of which I will need to scrapbook and document! THank you for the opportunity! Would love to give this kit a home! What a beautiful card kit! Thanks for the chance to win! Very cute kit. Thanks for the giveaway! Love the kit and all the goodies in it! I hope I win!! What a beautiful card kit! Love all the flowers. Thanks for the chance to win it. What a fun summer kit! Love the colours! Thank you for a chance to win! I love daisies. Your kit is fantastic! Such beautiful papers and embellishments! The stamp set is just perfect. This set gives me so many ideas for cards as well as multimedia projects! Thank you for the chance to win. Wow i would love to win! Awesome kit! Looks like just what the doctor ordered! I have been in the ICU for the last few days with pneumonia and heart issues and none of us thought I would be walking out but would leave on a gurney with a toe tag if at all. I am feeling very blessed to be home in my own bed today. It is going take some time to fully recover from this one! TFS! ??????? 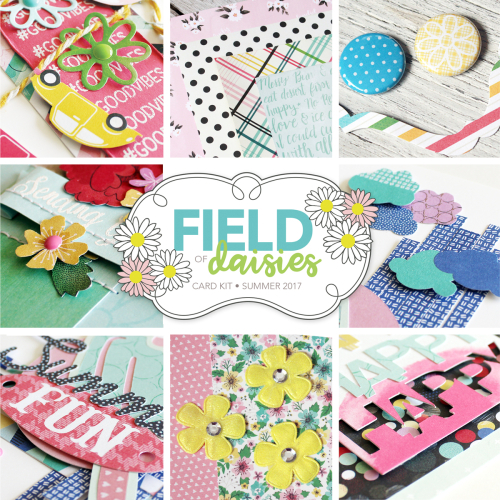 Thanks for the chance to win the Field of Daisies kit. What beautiful, summery papers! And I love all the extras included. I like the colors and prints for this collection. Oh my goodness…..that kit looks like so much fun. Plus the stamp set is so versitile. The colours are lovely in this kit. Was always a scrapbooker but card making has provided a new outlet for me. such a bright, sunny, cheerful kit! TFS! Such a happy and fun kit! Pretty, Pretty! Love this set! Soooo much fun for summer. What a lovely card kit! I would really like to make these! I hope I win! This gorgeous kit would replace my daisies and many more flowers that have dried up (even with watering) with the scorching heat we are experiencing here in southern Alberta going on now for 3 weeks!! I’m all for paper flowers right now. Thanks SCT for the beautiful things you curate!! Love this kit, what an incentive to work with flowers, that’s something I have neglected for a while. What a beautiful kit! So many options for fun and creative things to do with this. I especially love the papers and their bright, bold colors! FUN! I’ve always loved daisies. This looks like a great kit- it’s just full of gorgeous happy color. Thanks for a chance to win it. This card kit just screams summer fun! Love the bright colors and daisy patterns ? Thanks for a chance to win this fabulous card kit. Looks like a fun summery kit. I love sending and receiving homemade cards and your kits make it so easy! Thanks for a chance to win. Yes, please, I DO want to win. Cute kit! Looks like a beautiful kit! Thanks for the chance to win! How fun would all those flowers be? Awesome kit! Would be a treat to put it together! I love this collection. Thanks Shimelle, Echo Park, One Canoe Two and Paige Evans for providing such summery inspiration. winning scrappy goodness is always FUN!! this is a beautiful kit! what a wonderful set…daisies are so pretty! makes me happy to create with them and happyto send to others. I would love to win this beautiful kit! Wat an inspiring kit giveaway from jillabesn!! Hope to win this prize and make many cards and scrap pages with them # Sct giveaways #love making cards! What a lovely collection. It looks so bright and happy. Awesome kit! I would love to make some cards with this:). Thank you for the chance to win!! It all looks so cheery! I love this kit! it is so bright and colorful!!! very pretty colours in this kit. What a fun color theme card kit! It screams HAPPY! Lovely kit, thanks for the giveaway! Would love this, the complete kit is super cute! Plus the cut files are great to have also!